“Web is approaching the desktop” – Wahid Bhai said while demonstrating the new Flex project at KAZ. Flex is Flash but on steroids… well to be truthful Flex is Flash with libraries and an easy programming model and the nicest of all - a good eclipse based IDE. Back on Earth, we the “Psycho group” at KAZ had a week of free time in between projects. So in the time honored way at KAZ we decided to do a spacer project to try out silverlight in all its Alpha glory and MS’s super hype! We decided to make a webtop with silverlight that would show an abstracted backend filesystem exposed by WCF. This post is about our pains and joys during the project. Not gifted with great writing skills (apart from the coding kind) I will try putting down disperate items that we learnt or I felt like telling about our project. To develop with Silverlight 1.1 you need Visual Studio 2008 (code name Orcas). While writing this downloadable beta version is available from Microsoft site. You also need Silverlight 1.1 plug-in distribution – alpha is available while writing this. Though not necessary the Silverlight 1.1 SDK is highly recommended. The SDK includes controls, samples, documents which may be useful to start. Please note that the Silverlight plug-in is required on any client from where the site is viewed. Well not exactly true, but close enough. Silverlight 1.1 alpha distribution comes with a very limited set of controls. It has controls like rectangle, ellipse and label, canvas. It does not include button, edit box, scroll bar or any other advanced control. The SDK includes some controls like scrollbars. With no major controls available and no infrastructure for a shell, we soon realized that we need a petzold like approach to the project. 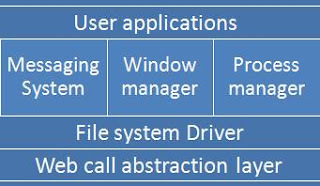 We actually need to create a windowing system and the bare basics of message management. Our final designe came out with 3 layers. Top layer is the application layer where user applications run. 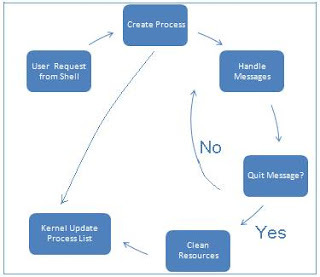 Middle layer is kernel which controls the events and communication between applications. 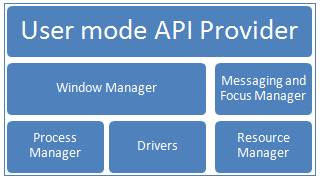 It also provides a set of API for application developers. The lowest layer is an abstraction layer to communicate with the web server. The system provides API’s for application developers for the platform while hiding the http calls – making the application development similar to desktop application development. Web call abstraction layer does that for user application. An event first comes to this manager and depending on the type routed to controls. If the user clicks on a control the focus manager updates the focus of controls. It keeps track of current on focus control. If it finds a change in focus it send OnLostFocus call to old control and OnSetFocus call to new focused control. With this exception most messages are routed to the focused control on arrival. The window manager keeps track of each window that is created on the system. At any time window manager provides the list of windows currently available in the system. A utility application like TaskManager or TaskBar can use the list for display and control the windows. In our case the TaskBar buttons are created from the list and user can control minimize or restore operation from the TaskBar application. To keep track of the windows the window manager uses an internal generic Window list. When a new window is created the window is registered with window manager and when a window is disposed the window is unregistered. The returned interface object can uniquely identify the process and it is required to handle the process. We used a Canvas for icon, a TextBlock for label and a container canvas to hold them both. Now if we add some getter/setter we get the icon control ready to be used. Window is a customized control- but is different from others. It uses mouse events to implement feature like drag/ drop, has a title bar and sizing buttons for minimize to system taskbar, maximize to cover full user desktop area or close button to close and dispose the control from the system.